29 Ounces - Adjustable 69" to 85"
Aquaglide combined their Red Feather Carbon shaft with the new smaller sized, high cadence Rhythm blade for incredible performance and value. 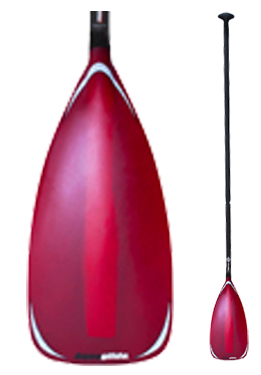 The Rhythm blade offers a smaller face and less resistance for increased paddle stroke cadence. Higher cadence provides better acceleration and less fatigue on the long hauls. Since the narrower blade has less of a tendency to flutter, the dihedral can be reduced, giving more power per square inch. Fiberglass blade and Red Feather Carbon shaft for light weight and quick reflex response. Includes carbon T-handle. Available in Uncut, Push-Pin Adjustable, or 2-Piece.